I find reading other blogs very enjoyable, and above all I like discovering new stuff - unfamiliar books, films, and trivia in particular - from them. I'd never heard of the 1968 film Pretty Poison, until I read an enthusiastic review on one of my favourite sites, John Norris's Pretty Sinister Books. I suggest reading John's review after watching the film, if you can, because his analysis covers the later part of the film as well as the set-up. I love stories about fantasists -examples that spring to mind include several of Ruth Rendell's finest novels, and that wonderful novel and film Billy Liar - and this is why I created Guy, the protagonist of The Arsenic Labyrinth. What is especially interesting about Pretty Poison is the dynamic of the relationship between Dennis and Sue Anne. It doesn't develop in the way you might expect. Sue Anne is played by Tuesday Weld. I've always rather assumed that she was really someone who was famous for being famous (and for being, for a short time, the wife of Dudley Moore) and I didn't realise what a charismatic performer she is. She is terrific in Pretty Poison, and although the film falters slightly towards the end, overall it's quirky and highly entertaining. Unsuccessful on its original release, it's become something of a cult classic, and I'm not surprised. I've mentioned before my admiration for Sebastien Japrisot (1931-2003), a renowned film-maker who is one of my favourite European crime writers. He conjures up plots as tricky as those of Arley and Boileau-Narcejac, but the stand-out feature of his work is the hypnotic quality of his writing. These attributes are evident in One Deadly Summer (1977), well translated by Alan Sheridan, which was adapted into a successful film starring Isabelle Adjani, which - as yet - I haven't seen. This is a story with multiple narrators, and Japrisot uses the device cleverly to reveal layer after layer of his psychological melodrama. We start with "Ping Pong", a naive but rather likeable man who is a mechanic and volunteer fireman with a crush on a beautiful but mysterious nineteen year old girl, Eliane, often known as Elle. When Elle sets out to seduce him, we realise that she has an ulterior motive. But what exactly does she have in mind? From an early point, it becomes evident that this is a story about revenge for an incident that occurred twenty years earlier, but what exactly happened, and who was involved is not quite so clear. Elle is as charismatic as she is scheming, and as she insinuates her way into Ping Pong's family life, we know that something terrible is destined to happen. Japrisot makes the reader desperate to find out exactly what fate has store for his characters. You'll have gathered that I really admired this book. Japrisot was hugely successful in France, but has never been as well known in Britain, though I came to his work because it was mentioned by Julian Symons in Bloody Murder, such a great source of information back in the 70s. I am, though, much more of a fan of Japrisot than was Symons. It's a real shame that he didn't write more novels; I haven't read a book of his that I didn't enjoy. A Quiet Place is a Japanese crime novel just published by the admirable Bitter Lemon Press. The author is the late Seicho Matsumuto, the translator Louise Heal Kawait. The book first appeared some years ago, but this is a new translation; I'm not aware of the novel having been available in Britain previously. I am developing a real enthusiasm for Japanese crime stories, and I was delighted to see BLP turning their attention to this rich source of mystery fiction. The protagonist is a government official called Asai. While he is away from home on a business trip, he receives a phone call -his wife has died suddenly after suffering a heart attack. Eiko was a youngish and attractive woman, but she suffered from heart problems, so although the news is as a shock, it does not come entirely out of the blue. However, when Asai tries to find out more about the precise circumstances of her death, he starts to wonder if she was leading a double life. Asai plays the detective, and finds out more than he bargained for. The story is very low-key, and although murder is committed, this is not a whodunit. In some ways, the author of whom I was reminded was Patricia Highsmith. But Asai is not as compelling a character as the youngish men who so often get into deep water in Highsmith's fiction. Overall, I felt the story never really moved out of second gear. Matsumoto (1909-92) was, nevertheless, an important figure in Japanese crime fiction. His books are notable for their social comment, and that is a feature of this story, although some of the points made are blunted by the passage of time. Much as I like Japanese mystery fiction, this isn't a truly memorable book, because there's rather less meat in it than I was expecting and hoping for. I certainly hope that BLP publish more of his work, because I'm sure that some of the other titles are stronger than this one. I'm back home, briefly, after an exhilarating Crimefest, superbly organised as usual by Adrian, Myles, Liz and Donna. It's always fun to go to Bristol, and the fact that this year saw a record attendance speaks for itself. For me, it was an especially memorable week-end. On Thursday, as usual, we had the Forgotten Authors panel: Jessica Mann, Susan Moody, John Curran, Len Tyler, and Guy Fraser-Sampson made the occasion engaging as well as informative. And in the evening came the pub quiz, now happily restored to an actual pub, in which I was part of a team that narrowly squeaked victory thanks to a tie-break. Even better, on Friday, at the CWA Daggers reception (where one of the speakers was Peter Davision, not only a former Doctor Who, but also TV's Albert Campion) , The Golden Age of Murder was announced as one of the books on the longlist for the non-fiction Dagger. Given that, in the past, this category has really been the preserve of books dealing with real life crime, this was not necessarily to be foreseen, and naturally I am delighted. And even more happily, at the gala banquet on Saturday evening (toastmaster Hugh Fraser, alias Poirot's chum Captain Hastings) Sheila Keating announced that the winner of the H.R.F. Keating award for best non-fiction crime-related book of the past year was...The Golden Age of Murder. Among many reasons why I was gratified was that Harry was very supportive of me in my early years as a writer - he was even good enough to give a lovely quote for the cover of The Devil in Disguise - and Sheila too has become a great friend. In fact, she and her delightful agent were my dinner companions the previous evening, but not a word was mentioned about the award. Sheila said to me afterwards that she is good at keeping a secret, and that's absolutely right. My other panel for the week-end was themed around Brit Noir and moderated with his usual expertise by Barry Forshaw; fellow panellists were Howard Linskey, whom I was glad to meet for the first time, Alison Bruce and Laura Wilson. There was plenty of time for socialising as well as attending other panels and talks (for instance by the creator of Death in Paradise, the hugely impressive Robert Thorogood). 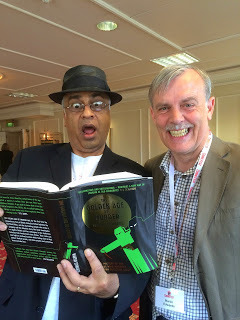 The photo of Ali Karim with the book was actually taken at last year's Crimefest, but Ali has kindly offered to send me some of his shots from this year, which I shall upload here in due course. In the meantime, I can only say that Crimefest goes from strength to strength, and if you have never attended, it is definitely recommended, whether you are a reader or a writer or both..
Julia's Eyes is a Spanish film from 2010, directed and co-written by Guillem Morales, which occupies the genre borderland between crime and horror. It's a creepy, chilling movie that has earned widespread acclaim, and for good reason. It's a dark and compelling story, several notches ahead of most films about deranged killers. The story concerns twins, Julia and Sara, who both suffer from an unspecified degenerative eye disease - a rather different one from the degenerative eye diseases suffered by friends which I've come across n real life, and some of the scientific details struck me as highly unlikely, but not so as to ruin the story. With this kind of movie, of course one needs to suspend disbelief. At the beginning of the film, Sara is being tormented by an unknown adversary, to the extent that she hangs herself. Since part of the torture involves playing "The Look of Love", which for me is one of the most gorgeous popular songs ever written, I found myself rather taken aback; but of course, it's all about irony. Sara hates the song, which again tested credulity to breaking point, but let it pass! The meat of the story concerns Julia's attempt to discover the truth about Sara's fate, and that of various other people who have the misfortune to get in the way of the unknown adversary. Several of the scenes are not for the faint-hearted, but crucially, the violence is not handled in a gratuitous way. Belen Rueda is Julia, and her performance, in a role where the temptation might be to ham it up, is impressive. A tense film that held my attention from start to finish. Phoenix is a film released in 2014 which has earned a good deal of critical acclaim. It's a German movie, directed by Christian Petzold, and it's set in the aftermath of the Second World War. The way in which German people struggled to come to terms with the post-war world, and the reality of the atrocities that had been committed, has yielded some fine novels as well as several good films,and it remains a haunting subject. The story opens with Nelly Lenz (played by Nina Hoss), a former singer who has suffered terribly during the Holocaust, and is in need of facial reconstruction surgery. Her friend Lene is a source of support, but the scale of the surgery means that Nelly's new appearance differs from her previous appearance to some extent. We learn that Nelly is destined to inherit a fortune, and Lene wants them both to make a new life in Palestine. Nelly, however, is fixated by her feckless husband Johnny, and contrives to meet him again. He doesn't realise she is the wife he thought had been killed, but the resemblance causes him to try to persuade her to impersonate Nelly, in order to get at the money. But the nagging question remains - did Johnny betray Nelly to the Nazis? The film is based on an excellent novel by Hubert Monteilhet, Return from the Ashes, which I much enjoyed a few years back. However, the screenplay departs radically from the original, and if you are looking for a classic film noir, or a storyline as clever as that in Trap for Cinderella, you will be disappointed. This is a well-made and thought-provoking film, but it's not a mystery in any conventional sense. Two cop shows with unlikely storylines have just would their way to an end. Both series had their merits, as well as some failings I became frustrated with the implausibilities of Undercover long before the end, despite my enthusiasm for the premise of a detective who fakes an identity to carry out undercover work. But Marcella, which I reviewed when it started, held my attention right to the dramatic final episode last night. Part of this was because of the brilliant performance of Anna Friel in the title role. She was so compelling that I found myself, by and large, able to forgive some of the outrageous plot contrivances. The principal culprit's identity was cleverly concealed, and although the motive might seem thin, I thought it just about believable. The plot borrowed a key plot device from one of Agatha Christie's best books, a reminder that despite the grittiness of modern TV crime drama, the influence of Golden Age fiction is more pervasive than many people realise. It isn't, for instance, mentioned at all in the otherwise excellent analysis of the finale by Gwilym Mumford in The Guardian (well worth reading, provided you've seen the series; but beware spoilers).. I'm drawing breath after a hectic week with a number of highlights. I've been involved in three events, including a murder mystery evening at Wrexham Library (hence the photo) which attracted a very large audience and a talk at Alsager Library. 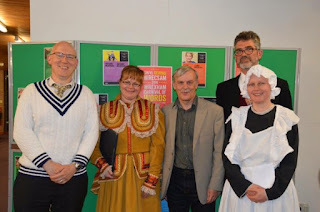 At both these events, a lot of interest was expressed in Golden Age detective fiction, and the same, perhaps more predictably, was true on Saturday, when I was the guest speaker at the annual general meeting and lunch of the Margery Allingham Society. The theme of my talk to the Society was the recent renaissance of interest in Golden Age fiction - not just the work of Crime Queens such as Margery, but also other writers, many of them much less well known. John Bude is an example who springs to mind. Another is Christopher St John Sprigg. When asked which book I was happiest to have persuaded the British Library to publish in its series of Crime Classics, I chose Death of an Airman, and it's clear from reaction on Saturday, as on other occasions, that this is a widely appreciated title. I also made the point that some of the as yet unpublished titles n the series are, in my view, among the best of the list. Plenty to look forward to there, I can promise you. The Society is clearly thriving under the chairmanship of that great expert on the Golden Age, Barry Pike, and the audience included two contemporary novelists, Mike Ripley (who has continued the Campion series) and Ann Granger, as well as a leading agent and several other luminaries. I enjoyed being shown the 'Crossed Red Herrrings' award (a forerunner of the CWA Silver Dagger) given to Margery for Hide My Eyes, and Barry also showed me an interesting part of the venue - the University Women's Club in South Audley Street, London- which was the room fictionalised by Dorothy L. Sayers as the place where Harriet Vane did her writing. Although my talk was, to some extent, off the cuff, my theme was one I've been thinking about lately, with a view to the St Hilda's Crime and Mystery Week-end in August, where I'll be giving a paper on the Golden Age revival. That there is a revival, and that it is significant, is to my mind beyond dispute. There's a recent blog post by Curtis Evans on this subject, which I was pleased to read; I agree with his observations about the renaissance. A few years ago, I assumed it was inconceivable that The Golden Age of Murder would attract a major publisher, let alone achieve lots of glowing reviews and two major awards. I think it's fair to say that the British Library were equally taken aback by their successes with the Crime Classics. What we GA fans must try to do now is to seize the moment, and help maintain this revival by encouraging the publication of more of the good books of the past, and continuing the very constructive discussions of them that are to be found on many blogs and elsewhere. This isn't always straightforward. In particular, copyright complications (even assuming one can trace the copyright holder - no luck so far with one or two of my favourites, such as Milward Kennedy) can make the process of republishing in-copyright books fraught with difficulty. Never mind; estates of deceased writers are, more and more, realising the benefits of a co-operative approach, and realistic financial expectations, and I hope this trend will continue. On the larger question of spreading the word about the merits of the best GA fiction - and the fact that some of it is far from 'cosy' - I am aiming to make further contributions to the debate - watch this space! My Forgotten Book for today was written by an author once well-known, who evidently fancied himself as a social commentator. This was Sydney Fowler, a name adopted by Sydney Fowler Wright, an author who became prolific in the fields of sci-fi and historical writing, as well as crime, after his career in accountancy came to an end, apparently as a result of severe financial embarrassments. The King against Anne Bickerton, first published in 1930, was well-regarded enough to become a green Penguin paperback, under the title Rex v Anne Bickerton, which makes it clearer that this is a story about a murder trial, rather than some form of royal vendetta. But it's still a slightly misleading title, because the larger part of the book is devoted to a coroner's inquest which precedes the trial. The wife of James Hackett, a businessman, dies as a result of arsenic poisoning. The husband seems to be in the clear, even though there are suspicions that he has been carrying on with Rose Dorling, the cool young woman who looks after the children. The deceased's sister, Anne Bickerton, is another suspect. She too has become involved in an unwise romantic relationship. The main point of the book, it seems to me, is for Fowler to turn his fire on the legal establishment. The police come in for a kicking, as does the judge and the prosecution. The element of mystery about the death is maintained quite well, but it's by no mean a gripping puzzle. I found myself waiting for a rabbit to be pulled out of the hat, and there was indeed an unexpected outcome, although a rather unsatisfactory one. The characters are evoked in quite a bit of detail, and yet some of their actions seemed rather unconvincing to me. The "hanging judge" was probably the most striking and credible person in the book. An odd story, then. Not entirely satisfactory, by any means, but intriguing all the same. Linda Stratmann combines her work as a crime novelist with the publication of non-fiction, and her latest title, The Secret Poisoner, recently appeared under the imprint of Yale University Press. In her capacity as membership secretary and committee member of the CWA, Linda is both industrious and highly efficient, and these very positive qualities are reflected in her book, which is packed with the evidence of her extensive research. The sub-title is "A Century of Murder", and naturally, given the subject matter, the central focus is on the many poisoning cases of the nineteenth century, although there is also some consideration at the end of twentieth century cases - including that of Graham Young, famed as a thallium poisoner -and one case that is even more recent, involving the use of a plant toxin called abrin. Linda's past career includes a spell as a chemist's dispenser, and the book is testament to her grasp of the scientific technicalities of poisoning (I once attended a fascinating talk she gave about chloroform, the subject of one of her earlier books). But she's also interested, very properly, in the stories behind the cases of murder and attempted murder that she chronicles, as well as in the rivalry between some of the leading toxicologists of the past. One notable feature of the book is that she is not content simply to focus on the well-known cases. So although we have plenty about Palmer of Rugeley, Christiana Edmunds, and Adelaide Barlett, there is less about Madeleine Smith and nothing about Florence Maybrick. Instead there is discussion of a host of cases that were previously unknown to me, and these I found particularly interesting. She also relates her material to developments in the law (for instance, at one time it was profitable to insure children and then murder them, a horrid kind of villainy that was eventually addressed by legislation). For anyone interested in the history of poisoning cases, this fact-crammed volume will surely prove indispensable. A quick trip to London for two contrasting events began brilliantly, when I received an email telling me that The Golden Age of Murder has been shortlisted for an Anthony award, at the New Orleans Bouchercon this September. The shortlist includes, as well as Kate White's popular MWA cookbook, and two other highly informative and interesting books, Val McDermid's book on Forensics, which I rushed out to purchase shortly after its original publication. So The Golden Age of Murder has won two awards and been shortlisted for two others; three of my novels have, over the years, been shortlisted for major awards (one of which, the Theakston's award for best crime novel of the year, for which The Coffin Trail was a contender, was actually won by Val) but I've never had an experience like this. It's a once in a lifetime thing, and to say I'm delighted is a massive under-statement. On Friday evening, I was one of no fewer than eight speakers at the British Library, talking about Eric Ambler. Three of Ambler's post-war novels have just been reissued in the BL's Classic Thrillers series, and I wrote introductions for each of them. I'm an Ambler fan - my favourite is his masterpiece, The Mask of Dimitrios - and it was a pleasure to chat about his work. I particularly liked Stav Sherez' suggestion that Ambler's work has something in common with that of the noir writers. A thoughtful and persuasive observation, I think. The next day, I headed for St James's Square (pictured above) for the London Library's celebration of its 175th anniversary, Words in the Square. There was a glittering cast of speakers, so I felt honoured to be included among the invitees. Last year, Golden Age expert and commentator Helen Szamuely took me on a guided tour of the Library, and I thought it a fantastic place, full of atmosphere and history. The panellists whom I was moderating were James Runcie (son of the Archbishop, literary curator, documentary producer and author of the books on which the highly successful TV series Grantchester is based), Simon Brett, and Kate Summerscale, author of The Suspicions of Mr Whicher, one of the most successful books about real life crime in living memory. Simon told the story of the creation of The Sinking Admiral, which is due to be published next month - something that I hope all crime fans who like a bit of fun with their fiction will anticipate eagerly. With writers of such pedigree, moderating is an easy task, and the hour sped by. The audience seemed to enjoy it, and I certainly did. One of the incidental pleasures of my visit to the USA was that, since I was moderating a panel about Sarah Caudwell, I needed to refresh my mind about her work. This was a real delight, and made very easy by the fact that she wasn't at all prolific. Four novels and various bits and pieces (one of them, the enjoyable Oxford story "Malice Among Friends" was reprinted by Crippen & Landru for the Malice Domestic convention attendees) are all that she produced.. Her third novel, The Sirens Sang of Murder, is in the same vein as its predecessors: witty, elegant, and cleverly structured. It's also surprisingly topical, given that the storyline deals with tax avoidance schemes and offshore tax havens. Long before the Panama Papers caused such a furore, Sarah was having fun with tax dodgers. And, as a tax barrister, she no doubt came across quite a few of them in real life. Again the narrator is Professor Hilary Tamar, and again Hilary's barrister friends, notably Julia Larwood and Michael Cantrip, are at the heart of the story. And, once more, Caudwell uses the epistolary style to relate much of the information about the plot. The key setting is Sark, a fascinating Channel Island where no conventional cars are allowed (though when I went there, tractors were remarkably common as an alternative form of transport). The narrow pathway connecting the main island with Little Sark is crucial to the plot. Someone asked us at the panel whether it was likely that Sarah visited Sark to research it. I feel sure she did the descriptions seem authentic to me. But although the setting is fascinating, it's the writing and the storyline that really command attention. The characters are delightful, even if they are not presented in depth. At Malice, I asked the audience whether they thought of Hilary as a man or a woman. Opinion was divided, though it seems to me that Hilary is slightly more like a man than a woman. Sarah, often asked the question, claimed not to know. This is a highly entertaining novel by a writer who should not be forgotten. "And then he woke up, and he realised it had all been a dream." I've arrived back home after a week in the United States that had an extremely dream-like quality about it. It's twenty-five years since my first novel was published, and I've had many great times since then (plus occasional setbacks) but this past week has been, by far, the best of my crime writing life. In that time, I've received the Edgar award and the Agatha award, been named on the shortlist of a third award (the HRF Keating award), and heard it announced that I'm to receive the Poirot award at Malice Domestic next year. Add to that a proposed translation of The Golden Age of Murder into Japanese, and a series of highly enjoyable encounters with crime writing (and reading) friends old and new, and you can perhaps understand why I'm feeling extraordinarily happy- and grateful - right now. I'd booked for Malice Domestic 28 long before The Golden Age of Murder was shortlisted for the Agathas, so when the book also turned up on the Edgars shortlist, it made sense to fit in my first trip to New York for almost twenty years. I flew into Washington DC to settle into the convention hotel and spend a little quality time with one or two good friends before taking a train to New York and checking into the Grand Hyatt -immediately bumping into Steve Steinbock, crime reviewer for Ellery Queen's Mystery Magazine. EQMM were holding a reception prior to the Edgars ceremony, and Steve and I went along there together, and chatted with the likes of Otto Penzler, of Mysterious Bookstore fame, and John Pugmire of Locked Room International. Then it was back to the Grand Hyatt, and the very lavish and prestigious banquet (sharing a tale with that fantastic writer Sara Paretsky) and awards ceremony. I'm not a believer in writing acceptance speeches in advance of knowing whether one has anything to accept. My approach is simply to improvise if I get lucky, or to have a few more drinks if I don't. Anyway, this time, despite the quality of the other books on the shortlist, by Frederick Forsyth among others, my name came out of the envelope. It was for me an utterly memorable occasion, and astonishingly, I even managed not to drop the Edgar statuette. (The photo at the top of this post was taken by Donna Andrews; the envelope is the one that Toni P. Kelner opened when making the announcement). I also heard about the Keating shortlist just before meeting up with Paul Charles for lunch. I first met Paul at the Philadelphia Bouchercon many moons ago, but it was almost a decade since we'd last met in person - though he helped, in his capacity as a leading music agent, to persuade Ray Davies to let me quote some lines from his classic pop song in the most recent Harry Devlin novel, Waterloo Sunset. Among other things, we talked about the challenge of "hanging on in there" as a midlist writer, something we've both tried our utmost to do over the years, and we agreed that we'd been very fortunate to have a second income stream other than writing, which has at least enabled us to write what we believe works best, rather than simply to chase the market. I hope to feature Paul on this blog before long. Then came a reception followed by the Agatha awards ceremony, and I had the pleasure of hosting a table featuring some of my favourite partners in crime, such as Kathryn Leigh Scott, Steve, John, Josh Pachter, Joni Langevoort, Shawn Reilly Simmons, and Charles and Caroline Todd. Lots of entertaining conversation before the announcement of the Agatha awards. After another acceptance speech (when I drew a spur of the moment comparison between Malice and that early-established social network, the Detection Club) I had the pleasure of hearing the announcement that next year the convention will mark my contribution to the genre with a Poirot Award. Suffice to say, it was another wonderful night. Sunday morning brought brunch with a small group of us - including Art Taylor, a notable exponent of the short story who has now turned to writing novels with equal success, and has won Agathas in each of the last three years - hosted by Janet Hutchings, editor of EQMM, After spending ages working out how to ship my awards back to the UK, I interviewed another of the weekend's honorees, Doug Greene, about his long career, which includes a definitive biography of John Dickson Carr, among much else. In the audience, incidentally, was Shelly Dickson Carr, grand-daughter of the master of the locked room mystery and herself an author of note. It was a real pleasure to meet her (and thanks to her for the photo with Doug and me, below). The "Agathas tea", as usual. concluded a truly fantastic convention. My admiration for the work done by Verena Rose and her colleagues on the Malice board increases the more I learn about what they do. To take just one example, they have over the years raised a total of over $200,000 for charitable causes. Wow. That evening I had dinner and a few drinks with Doug and Sandi Greene, and we had the chance to reflect together on a wonderful few days. It's almost a cliche to say that the writer's life is a solitary one, and sometimes a lonely one, and to some extent there's truth in the old saying. But as I've tried many times to illustrate on this blog, a writer's life can be greatly enhanced by the social side of things - and in the world of crime writing, that social dimension is hugely enjoyable. Every writer experiences setbacks from time to time, and I know plenty of gifted authors who have lost heart; something that I find deeply regrettable. I spent a lot of time with some marvellous people during my few days in the States, and I returned home reflecting that the successes that have come my way of late owe a great deal to the generosity and support of others, especially when times have been challenging. The crime writing and reading community is highly cohesive, and it is one I'm truly proud to belong to. Zugzwang, first published nine years ago, is an interesting thriller by the Irish writer Ronan Bennett. It was recommended to me by my agent, with whom I've been discussing the possibility of writing a thriller. The point he emphasised was that the story has an intriguing history. Originally, it appeared as a serial in the Observer, and as a result there was a need to structure the plot in such a way that there were plenty of cliffhangers. Zugzwang is a term in chess. It describes a deadly position in which a player is obliged to move - but every move only makes his position even worse. This is a rather good metaphor for the plight of a hapless character caught up in events beyond his understanding, which is the fate of Otto, a Jewish psychoanalyst working in St Petersburg in 1914. Chess is integrated into the story, again in a way that I found interesting - and satisfactory. Otto is playing a long running match, and the positions in the game are reproduced in the novel. His patients include a gifted chess player, and a beautiful married woman, to whom he finds himself attracted. But he lives in dangerous times, and the police start to take an interest in him - and his patients. Even worse, it turns out that his young daughter Catherine is mixed up in some murky business, and before long, both Otto and Catherine are thrown into prison. Overall, it seemed to me that the first half of the book worked rather better than the second. The characters are drawn well, but my enthusiasm began to flag as increasing amounts of Russian political history were introduced (a note at the end of the book lists sources, and believe me, there are a lot of them...) As a result, a book that might have been a minor masterpiece didn't really live up to its potential. But Bennett is a capable writer, and I'm glad I've had the chance to study his approach to thriller writing.